Speaking this morning at the press junket for Inception, Tom Hardy spoke with a small group of journalists about his upcoming role as Max Rockatansky in Mad Max: Fury Road, the fourth entry in the sci-fi franchise. Q: Can you talk about how you got involved? Is that shooting? Is it ready to go? 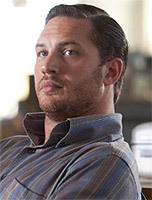 Tom Hardy: I’m obviously limited as to what I can say. These things are always binded to secrecy and I think that’s a good thing for the film anyway. I’m not allowed to give away anything. Without incriminating myself in any way, it’s a very big film. To step into the shoes of Mel Gibson… George [Miller] and Mel created the franchise “Mad Max,” which started off as an independent which then blew up. It took off. It became the “Mad Max” as you know it with t-shirts and DVDs. No computer game yet, but you know, it was early days. This was back before internet. Before all that sort of stuff. I was born the year it came out, so now it’s very funny that I’ve now been asked to play Mad Max. I spent four hours. It was kind of an anomaly. There were many, many actors that would probably be right for Mad Max and there’s many out there who could probably do an exceptional job to portray him. It’s especially a challenge to step in the shoes of such an iconic character. I’m aware that I’m going to take a certain number of casualties when I go in and play him. If I concentrate on that, it’s obviously not going to be the best thing for the project. We have to take it differently, as George is taking it. It’s a relaunch and revisit to the world. An entire restructuring. That’s not to say that it’s not picking up or leaving off from the Mad Max you know already, but it’s a nice re-take on the entire world using the same character, depositing him in the same world, but bringing him up to date by 30 years. Mel would be perfect for it but, for some reason, he’s not doing it and I am. You can expect the same amount of grit and rawness and authenticity and performance, I hope to deliver. But that’s really the crux of me and George to deliver and all the other actors as the other characters. But also we have the new world afforded to filmmakers today with all the opportunities. I think the boys that did “Lord of the Rings” are involved. That kind of stuff as well. CGI is not going to be — I think it’s going to be much more about how you deal with action. These things are going to be really there. Big rigs, big explosions, big car crashes. Big violence, you know. It’s going to actually happen as opposed to doing a 2D turned to 3D screen. It’s going to be an adventure, let’s put it that way. We’re shooting for a year. Q: Can you at least say when you’re going to be in front of the cameras? Hardy: I can’t say when I’m going to be in front of the cameras. I’m actually headed tonight to Australia to start some stunt-training. I’m training now. Even though I’m smoking. I’m meant to drop 30 pounds so smoking and one meal a day is my training at the moment. I’m going to start fighting soon. The harder stuff, as we get close to the line. I’ll probably get three or four months of fight training out there. Seven days a week. All that kind of horrible s**t.
Q: So you’re going to train for three months and then shoot for a year? Hardy: Shooting is probably nine months. Training is allocated as two months. We don’t know if that’s going to push a little bit or come up a little bit. It’s a gray area. There’s very anomalies and shifting papers. All kinds of people’s shifting schedules, from what I’m aware, need to be tied down. The movie is absolutely healthy. It is going, it’s just a question of, not if, when precisely. Q: You mention shooting in Australia? Have they decided to displace the geographic non-specificity of the original? Hardy: It’s absolutely the same spot. The same spot. Q: So you’re going to have an Australian accent? Hardy: This is a new area to me. It’s up to people like George. I don’t know. I don’t know. Whatever suits the revisit. It would be bold for me to give you an honest answer now. I don’t know and a lot has to be left to the process. It depends on what feeds the project for the best of the project, always. Q: You’re dropping 30 pounds? Hardy: I’ve already dropped it. Q: Are you aiming for a muscular cut, being very thin? What the look you’ve envisioned? Hardy: Imagine a hungry wolf. Or like when you put a cat in the bath. You grab a cat by the throat and stuff it under the f**king water. You know what it looks like? That’s what I’m going to look like. But like a puma. Very hungry at very dangerous. It’s imperative. This is the kind of guy who’s not well. So I have to create that reality.